Mills' sweet spot is definitely about 4th grade. I loved that this one included a Wax Museum/Biography Tea-- when I was in 4th grade, I had to dress up like Clara Barton. Definitely a great topic, and handled well. Children's chapter book about a boy who wants to play the saxophone, but his single mother doesn't have the money to buy/rent the instrument. Riley has issues with organization, time management, and misplacing important things like homework assignments and textbooks. But he really wants to join his school's instrumental music program, so he has to get it together and show his mom he can be responsible. His teacher assigns all the students a biography subject for a research paper and role-playing tea.As Riley and each of his classmates works on their report, they learn, and begin to absorb and even emulate, the personality traits of their biography subject. Riley is a very believable and relatable protagonist, which makes it especially satisfying as he develops Teddy Roosevelt's resourcefulness and perseverance. Riley's friend Grant sheds some of his materialism and becomes more charitable like his biography subject, Mahatma Ghandi.Humorous and honest. The resolution comes about a bit too quickly. Even though Riley actively works toward his own goal, he doesn't ultimately discover his own solution, which makes the ending less fulfilling than it could have been. Despite that, this is an enjoyable chapter book. Many kids live in single-parent households and will empathize with Riley's financial crunch. Very nice book for 3rd or 4th graders to read with a teacher, especially before starting a biography project (which seem to crop up in 3rd or 4th grade). It was a fun short-read and an excellent book for getting kids started on reading real chapter books. Humor, believable characters, a look at research, a kid who decides he must emulate his biography subject Teddy Roosevelt, and persevere if he is to accomplish his goal of playing the saxophone. Along the way, he learns a lot about Theodore Roosevelt, develops responsibility, time management, problem-solving, and entrepreneurial skills. And makes a good grade on his biography report! More than anything, nine-year-old Riley O'Rourke wants to play the saxophone in music class. Unfortunately, Riley’s mum cannot afford to buy or rent an instrument for the boy. In the meantime, Riley's fourth-grade class is busy preparing for a biography tea in which students will attend dressed as the famous people they have researched and written about. Riley is assigned Teddy Roosevelt. As Riley reads about the explorer, soldier, and President with the can-do attitude, he begins to set goals and see possibilities where once he thought didn’t exist. The boy eventually saves nearly half the money needed for a second-hand instrument. When he finds out the saxophone he was saving for has been sold to someone else, he feels defeated.He wasn't Teddy Roosevelt . . . He couldn't charge up a hill in war, or be elected president, or dig the Panama Canal. He couldn’t even get himself a saxophone so he could do fourth-grade instrumental music. All is not lost, however. When Riley's friends find out about his problem, they rally around and help him come up with a Roosevelt-like solution. R. W. Alley's charming black-and-white drawings complement the story perfectly. 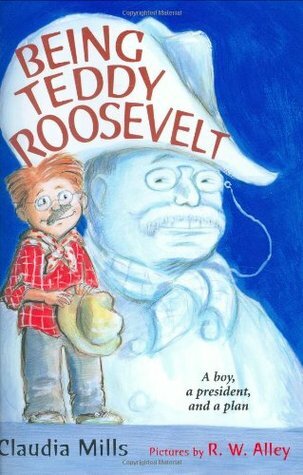 Being Teddy Roosevelt is an engaging chapter book about friendship, setting goals, and the importance of never giving up. Inspiration comes from unlikely places, especially for Riley O'Rourke. Who knew that Teddy Roosevelt would have given him the incentive to get what he really wanted...a saxophone. Mrs. Harrow assigns a famous person to each student to report on during their Biography Tea. Riley researches, reports on, and virtually becomes Teddy Roosevelt for the day. He talks like him, dresses like him, and acts like him. Teddy is full of perseverance in the face of adversity and attacks every problem with a well-thought out plan...that is just what Riley needs to fulfill his dream of playing the saxophone!Riley struggles to save up money for a used saxophone, however along the way little setbacks try to thwart his goal. But, just like Teddy, he perseveres and gets back on course. With the help of his friends, he finds a way to make his dreams come true...Bully for You! Riley O'Rourke!Delightful, black & white illustrations accompany this uplifting story of 'stick-to-it-iveness', friendship, and determination. A quick read that will have kids wanting (maybe) to read about the lives of famous people. In this story, Riley, a fourth grader, is a mediocre student (and that is him trying his best!) who has a panache for forgetting about things. Riley is raised by his mother in a household where money is tight. Sadly, though Riley has fallen in love with the alto saxophone and jazz music, he won’t be able to learn how to play the instrument since his mother cannot afford to either rent or buy a sax for Riley. But when Riley is assigned to write a biography about the U.S. President Teddy Roosevelt, Riley channels Roosevelt’s can-do never give up attitude to overcome his own obstacles and thus ultimately acquire his beloved saxophone. The short chapters, quick pacing, and frequent black-and-white illustrations will both appeal to and assist young readers in this early chapter book. There isn't anything extraordinarily special about "Being Teddy Roosevelt", but it is fun and humorous and readers will definitely leave with a smile on their faces...and perhaps even with a more positive attitude toward conquering the pitfalls of their own lives. Best for grades 2 to 4. Riley, a fourth-grader who has difficulty with organization, is required to read a biography about Teddy Roosevelt, write a report, and then attend a formal tea at school while dressed as the former president. While Riley and his classmates read their assigned biographies, Riley discovers that most people, famous or not, have obstacles to overcome. Riley's biggest challenge is finding a way to study the saxophone in instrumental music when he doesn't have a saxophone, nor the money to rent one.I think kids who live in families where money is tight will relate to Riley's feelings. They will understand his longings and also his hidden jealous feelings towards his best friend Grant who comes from a fairly wealthy family and has many material blessings.What I like most about this book is that it may encourage students to read biographies and become inspired by the lives of others. Riley and everyone in his class has to pick a famous person, read their biography, and then act like that person during a tea. Riley is Teddy Roosevelt. At the same time Riley really wants to be able to play an instrument in the school band but he and his mom don't have the money for it. Can Riley use what he learned about Teddy Roosevelt to help him get what he really really wants. Cute book that would be a good intro to a third grade biography project. Teachers will like this one. Preparation for the 4th-grade "Biography Tea" in which each student impersonates the famous person whose biography he or she read leads Riley to become more responsible as he learns about Teddy Roosevelt. The Rough Rider's determination to overcome difficult health and personal problems inspire Riley to work hard to improve his school work and to earn the saxophone he dreams of playing. This is a gentle story and a quick read with characters who are both likeable and totally believable. Riley is a young man who has to pick a historical figure to write a report on in school. He ends up learning about Teddy Roosevelt and how he strives to overcome adversity at every turn. Riley longs to learn how to play the saxaphone, but because of money problems he can't afford one. With help from his friends and a little luck, Riley learns how to get things done the honest way. A great read for young readers. Filled with great illustrations, this is a great addition to any collection. Riley O’Rourke is not so good at keeping track of things. He’s constantly losing his notebooks and homework, and his report card shows it. When his teachers announces a big biography project that will culminate in a tea party where everyone dresses up as their famous person and gives a report on them, Riley thinks he might rather die. YES for our library.This was a fine book for our younger readers (3, 4, and maybe 5), but it felt much to young to fit in our list of books for the award. The story wasn't gripping enough and lacked the substance to stand out as an outstanding read. True, not all books need to... but against the other titles we're considering, Being Teddy Roosevelt can't hold its own. While studying Teddy Roosevelt for his 4th grade biography assignment, Riley is inspired by TR's determination and perseverance. Riley uses these traits to figure out a way to get the saxophone he so desperately wants.Grades 2-4. A short and easy-to-read chapter book that would be especially appropriate for the reluctant 4th grade reader. The 5 stars is given for the book's ability to make an impact on my student's reading. I had a group of my 5th graders, middle level ability, read this book for guided reading. The students really enjoyed reading this book. They were engaged in the reading and able to move through the packet with good progress. Realistic story about a boy who changes his destiny because of a book report. Claudia Mills created a heart-warming story around the backdrop of the poverty of our time. An ordinary boy who struggles in school while his single mom struggles to pay the bills is inspired to go the extra mile to get what he wants after reading a biography of Teddy Roosevelt. Read this one while at the pool today. Not a difficult read, will be just right for some of the kiddos in my class this fall. Enjoyed the characters and how they really got into their biography project! this is a fun little book about a school assignment where kids have to dress up like famous people in history. One poor kid has to dress up like Ghandi but really gets into it and the results are both touching and funny. A great little book. A fine middle grade book about how to problem solve with lessons on some famous people from history. The book is not quite subtle about its lessons, but on the other hand, it isn't bludgeoning you over the head, either. I liked this book because I was a history major in college and it's a great way to teach kids about history. Plus I got to meet the author and she's amazing! Writing all of her books from 5-7 in the morning over Swiss Miss Cocoa! Great quick read! This 2009-2010 Iowa Children's Choice book was delightful. Good choice Iowa! Loved this book! Such a cute book and I hope that teachers out there really have their classes do these types of assignments. Elementary. Cute for a unit on biographies, but not a must-read. I read this book aloud with my sister this evening. It was hysterical. An enjoyable, quick read that had us laughing out loud. Definitely a good dollar store find. This book really helped paint a picture for what I wanted to "Hall of Fame" to look like with my students last year. Glad I shared it with them! It was a very realalistic book It's a ICCA. Claudia mills has a talent for weaving two seemingly unrelated stories together and creating believable characters. this is a great chapter book for elementary kids. Sometimes learning about presidents is a boring subject but reading about a president in a narritive form gives readers a better look into their lives. this is the cutest bookesp. for reluctant readers,(esp. boys)cut picturesfunny, funnymain character...just the right amountof text...i will recommend highlyto kids!